Minneapolis Firefighters Operation Warm | Providing the gift of warmth to local children, Minneapolis Firefighters are ambassadors of Operation Warm's mission. 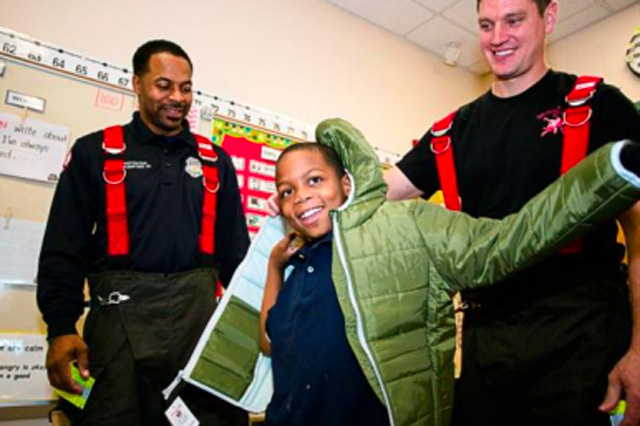 Providing the gift of warmth to local children, Minneapolis Firefighters are ambassadors of Operation Warm's mission. The Video From Our September Event Is Available — Take a look! Minneapolis Firefighters – Operation Warm Year 2 from MplsFilms on Vimeo. Thanks again to all of our corporate sponsors and the Minneapolis community for rallying behind this program and these kids. We’re looking forward to next year — we’re trying to raise 3,00 coats! If you’d like to help us out with planning or execution, please leave a note in the comments or contact Justin Johnson. We want to extend a huge thank you to everyone who made last weekend’s fundraiser event so great! With your help, we were able to exceed our goal and provide more than 1,000 coats for kids in need! Check back for details! If you took any photos at the event, please Tweet them to us at @MFD_Warm! Join Us on September 6th at the New Fulton Brewery! This September, join us in our goal to provide warmth to 1,000 less privileged children in South Minneapolis. As ambassadors for Operation Warm, it is our mission to provide American made coats to kids. We believe that beyond warmth, new coats help kids have higher self-esteem, stay in school throughout the cold winter months and free up tight family resources that can help create a better future. Since our fundraiser last year was such a success, we’ve decided to double our goal to 1,000 coats for the 2015 school year! But we’re going to need your help. Your $20 donation gets you access to some awesome food and beer, a silent auction, cigar roller, bagpipes, and musical entertainment by multiple bands, including White Iron Band as the headliner. You can get your ticket here! Join us in our mission for an excellent night out with some great people! Don’t forget to connect with us on Facebook and Twitter to get more information as it comes!